During last few years many comparisons of video, audio and image codecs were carried out by our Graphics & Media Lab at Moscow State University. All of them used objective metrics like PSNR, VQM or SSIM. This fact has raised reasonable questions on adequacy of objective measures to the subjectively perceived quality, which is the main parameter of a codec's performance. Goals of our assessment are subjective comparison of new versions of popular videocodecs, comparison of results with objective metrics and subjective assessment technology testing. Comparison of results with objective metrics. Main quality parameter for a codec - subjective impressions of a viewer of a compressed video. Latter is the main idea of subjective comparison methods - quality score for a compressed sequence is the average opinion of a group of experts on its quality (MOS, Mean Opinion Score). There are lots of methodologies of subjective assessment, many of them are implemented in MSU Perceptual Video Quality tool that was used for the assessment. Our comparison is using SAMVIQ - method that was recently developed by EBU (European Broadcasting Union), PDF with the comparison contains its description. 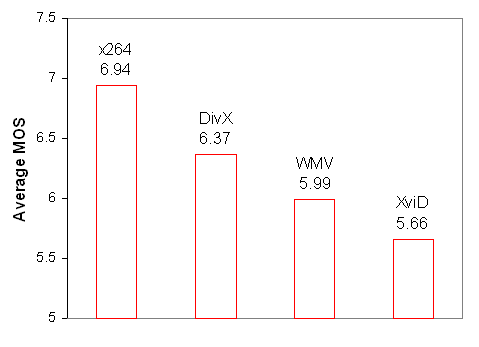 On a graph below you can see average MOS for all codecs, the higher the better. Probably, XviD results could be improved by switching on deblocking algorithm (this algorithm isn't used by default). 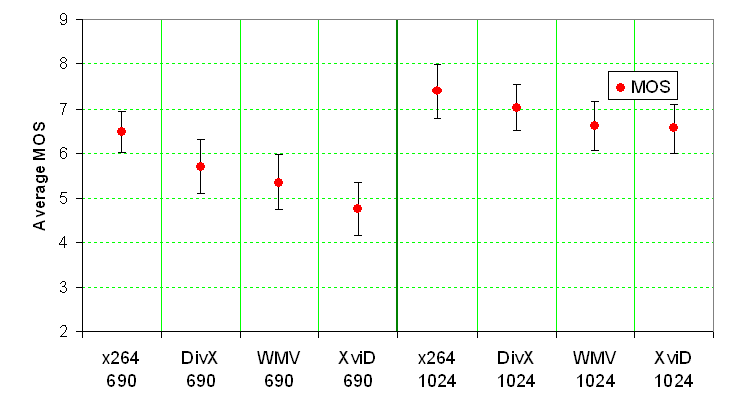 Following graph illustrates average MOS for each codec and bitrate and its' 95% confidence intervals. 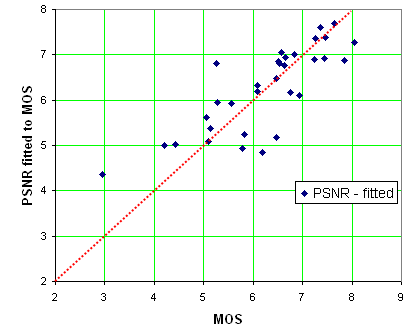 PSNR, VQM and SSIM were measured for each sequence with MSU Video Quality Measurement tool, description of these metrics can be found on this page. 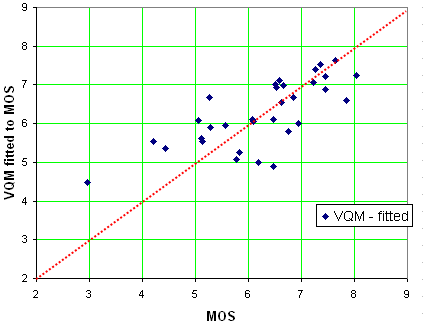 Note, that "VQM" metric refers to algorithm of Feng Xiao, not proposed by VQEG objective quality metric. 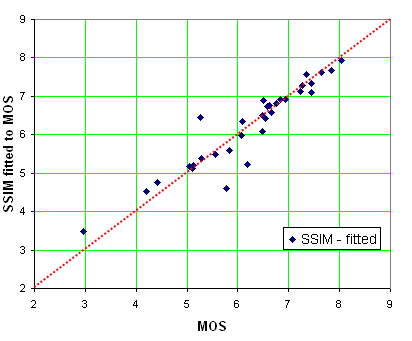 The following graphs illustrate relation between subjective opinion and an objective metric: if set of points is close to a straight line, then the metric is adequate to the subjectively perceived quality (values of PSNR and SSIM were mapped on MOS scale, see PDF with the comparison for more details).